This morning, whilst driving home from the park and the grocery store, I spied a series of bags tucked between the two storage units serving as the foothills Goodwill drop-off site. Because I've been dabbling in sewing, especially t-shirt recon and capri-sun tote bags, I pulled over to check out the contents of those bags, just in case there was something in there I could use in my dabbling. I hopped out of the car and grabbed up those bags and shoved em in the back seat and peeled out on my way home. And what I found inside.... oooh, it's like Christmas time for me. Fun, fun stuff. 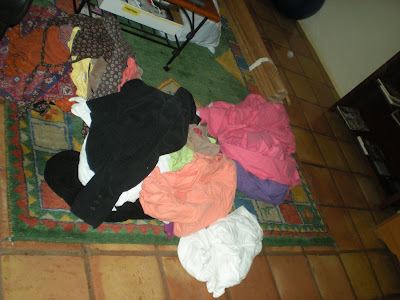 Like my alter ego dumped the contents of her closets, both clothes and linen, for there are several sets of coordinating queen sized sheets. Soon you'll see the reason for my glee. Off to school now, but when I get home I'll show you. My guilty treasures. Can't wait to see this. And this from a child who screamed at me for picking up a roll of fabric softener sheets along the road. This makes me laugh. I am still not brave enough to do this. did YOU take the car seat and was out on the curb for a big bros big sis pickup? Cookski: heck no! I wouldn't be caught dead wearing that thing!